The tool of direct democracy — referred to as ballot initiatives in the United States and referenda worldwide – gives citizens an opportunity to directly approve or reject laws that govern a wide range of public policy issues. Some of the most controversial topics around voting rights, sovereignty, immigration, environment safety and constitutional reform are increasingly brought to public vote from Europe, to Asia and Africa. 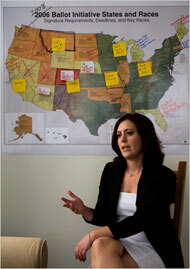 Kristina Wilfore is one of a handful of world-wide experts in referendum campaigns. With a near 100 year history of waging referendum in the United States, there are many lessons that apply to the global stage of direct democracy. As the former director of the preeminent think tank to utilize the initiative process in the US for progressive change, and create a check and balance to bring integrity back into the system, she can serve as a resource to you. Referendum can be used as a valuable mechanism to increase citizen voice in encourage public debate and engagement. However, in the wrong hands, it can be a tool of well-funded special interests or authoritarian governments to divide and wedge opponents and create the illusion of public consent. Whether your interest is to understand more about the process in your country, prepare for a particular vote, or to ensure the voting and election for a referendum has integrity, let me be of assistance to you. Watch Kristina on C-Span talk about ballot measures in the United States.